That’s what I call going back to your roots. Fantastic Four by Jonathan Hickman, Vol. 2, Marvel Comics. My weekly look at the trade collections of writer Jonathan Hickman’s current run on Fantastic Four brings me to the second volume, subtitled “Prime Elements.” I’ve already complained about the flaws of this collection, which reprints issues 575-578—that it’s all world-building and no story—but let’s focus for a moment on what’s awesome about it. Really, that’s just giving Sue her due. Reed knows where the bodies are buried. After all, he put them there. 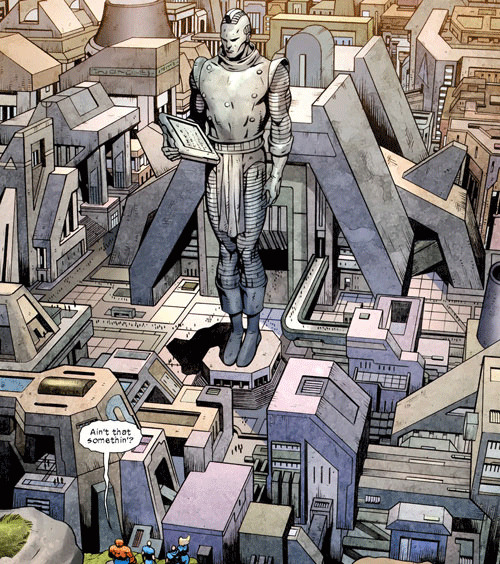 Also, frankly, the world-building Hickman does in this installment is seriously cool. Hyperevolved Moloids, and the Mole Man freaking out about losing his slave labor force? Intriguing! Weirdly fishy lost races of Atlantis? Tell me more! Evil Negative-Zone giant bug things that hide in people’s skin? Ewww! Yeah, that’s not good. She should get that looked at, maybe. Dale Eaglesham is back on art duties throughout this book, and some of the environments and creatures he creates are breathtaking. Particularly underwater, there are a number of pages where the pictures are doing the storytelling, and he does a beautiful job with it. And all they got me was a lousy T-shirt. I’m dubious of the idea that the never-before-seen Inhumans of alien races consider themselves one family with the earthborn Inhumans, and more so that their queens consider themselves additional wives of the familiar group’s king Black Bolt. (It’s hard to imagine that his wife Medusa would put up with that.) But the races that Hickman chose to use are a lot of fun. I’m particularly pleased about the Dire Wraiths, the constant antagonists of Marvel’s old toy tie-in series Rom: Spaceknight. Marvel lost the license to Rom a long time ago, which means not only that a great series from the 1980s can’t be reprinted, but also that Rom’s frequent appearances in other comic books leads to a lot of missing issues in collections of other series, whether it’s Hulk or Power Man & Iron Fist. The fact that the Dire Wraiths are still hanging around the Marvel Universe is a treat, but they haven’t been used much, so it’s great to see them here. It is odd, however, that none of these shape-shifters seem to use the body form that all males had traditionally been depicted wearing when not disguised as something else. Somehow “Inhuman” is an odd name for mutated races that weren’t human to begin with. In fact, all four of these races are on the obscure side. The benevolent horse-headed Kymellians haven’t made many appearances outside of Power Pack—maybe because they’re pretty clearly designed for a kids’ series—and the scaly-skinned Badoon have popped up now and then as a generic conquest-obsessed alien race without any notable powers, but an oft-neglected one because they’re just not as interesting as, say, the Kree, Skrulls or Shi’ar. The Centaurians are known only as the noble-savage race that spawned the archer Yondu of the 31st-century Guardians of the Galaxy. And there are just a ton of awesome moments along the way, Some ragged Moloids crawl out of a manhole to deliver a message from the Mole Man and the spokesmoloid is immediately hit by a truck, so the others pop off his still-living head and carry it along so he can speak his peace. (Amusingly enough, that head is still hanging around the Baxter Building.) A giant monster bursts through the floor and unfurls its tongue, carrying on it the Mole Man, who bows low to the FF and says “My oldest of adversaries.” I mean, seriously, how cool is that? He may not be much to look at, but the man can make an entrance. Each of the FF gets a cool character moment or two along the way—Sue, most notably, gets to speak for all humanity as emissary to the new Atlanteans—but Johnny, if anything, seems to have regressed since last I saw him. He’s always been on the shallow side, but he’s gone back to his roots of all pranks and hot chicks. Frankly, he’s kind of obnoxious, and it begins to seem as if Hickman isn’t quite sure what to do with him, so it’s a relief when Reed gently tells Johnny that he really needs to get his act together. Oh Johnny, you incorrigible scallion of rap. But enough about that. On to book three!